“In My Bath” – a book that makes taking a bath fun! 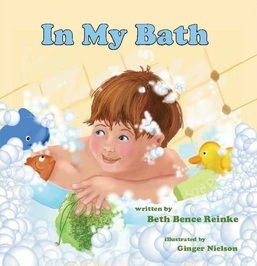 The picture book “In My Bath”, written by Beth Bence Reinke and illustrated by Ginger Nielson, is a fun, imaginative story that will encourage even the most reluctant young bathers to take the plunge. The star of the book is a young boy with a big imagination. Even though the child is never actually named, you see him playing with a dolphin, swimming with a manatee and paddling along the river with a beaver. When I first picked up “In My Bath”, my eyes were immediately drawn to the colorful, fun illustrations. Each page is filled with playful bubbles, beautiful scenery and animals of all kinds. I was most impressed with the artist’s ability to bring the animals to life and give each its own unique personality. She also did an excellent job of choosing colors that blend together well, making each picture a work of art in its own right. Even though the art behind the story was what first caught my eye, once I read through the text, I found it very charming. I actually read through the book several times, because the story has a natural rhythm that is just plain fun to read. Although the story doesn’t really rhyme, the author implemented several tricks that make the reading more pleasurable. First of all, she uses words that are rich with sensation. Words that make you feel that you can see, hear, smell, taste and touch exactly what is happening in the story. She also has employed some alliteration devices, in other words, she uses the same consonant sounds often, almost turning some phrases into tongue twisters. All in all, this is a great read to share with your young child. They will love the pictures and the fun, fanciful storyline, and you will love seeing them take a bath without an argument for once. To order the book, you can visit the author’s website, www.bethbencereinke.com. “In My Bath” has its own page under the ‘Children’s Books’ heading, with ordering instructions, reviews, coloring pages, a word search and a link to the illustrator’s website where you can view a slide show about the book. Maranda, I can’t thank you enough for this insightful, in-depth review of In My Bath. Your time and attention to the book is much appreciated. :o) Blessings to you and yours. Glad you liked it Beth! It really was an enjoyable read! I’m so glad you enjoyed In My Bath and gave it a review that will create interest in the book. Thanks for stopping by to read the review Vivian! Thanks for sharing the great review, Maranda. In My Bath, along with Beth’s other fun books, are much enjoyed by my grandchildren! I haven’t read Beth’s other books yet, but will definitely check them out now! This is such a cute book. My boys and I loved all the different animals, too. Thanks for stopping by Rena! Don’t forget, if you ever need a review, I’m here for ya! Great review! Beth’s book is a keeper! Sweet of you to say that, Donna. Thanks for popping in to read Maranda’s review. A v ery nice review for a lovely book. In My Bath is a fun read that kids should enjoy and maybe will be more eager to take their baths. What a wonderful review Maranda wrote. You must be thrilled with it Beth.